As part of TPR’s effort to contribute toward a more level-headed discussion on the independence/autonomy debate, we believe a good place to start is greater accuracy in distinguishing between “freedom” (rangwang), “independence” (rangzen), and “autonomy” (rangkyong). FREEDOM: Freedom is a subjective term. There is no single definition of what all people would consider freedom. Fundamentally, freedom means that one feels free and acts freely (which is a bit of a tautology). It includes the absence of coercion or constraint, and liberation from the power of another. For a slave, freedom can mean the removal of shackles. For an oppressed minority, freedom can mean achieving the same civil rights as the majority population. 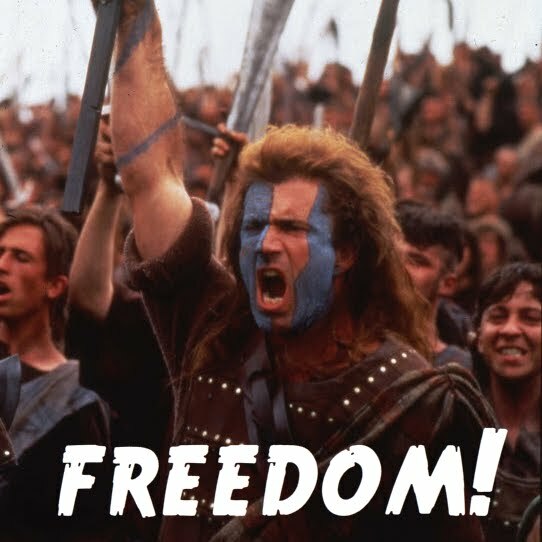 For a subjugated nation (think William Wallace as depicted in Braveheart), freedom can mean breaking the political ties to a colonizer. Basically, freedom is feeling free. INDEPENDENCE: Independence is an objective term, as defined in political science. Independence refers to sovereign statehood. When the World Court looked at Kosovo’s declaration of “independence”, it was understood by all that this meant its claim to be a sovereign state. One can debate whether any state is truly “independent” when impacted by forces like great-power politics and global trade. But this is not the same as challenging the global system of formally sovereign states. The idea of sovereign statehood has been a fundamental principle of international law since at least 1648. Basically, independence is having a separate country. The very wide range of global forms of autonomy are summarized in a 2004 study of Tibetan autonomy, authored by the late Ted Sorensen and the law firm Paul Weiss Rifkind Wharton & Garrison, and published by the Belfer Center at Harvard. Basically, autonomy is having some type of self-rule, but as part of a larger country. From the brief description above, it should be obvious that there is a big difference between the subjective term “freedom” and the objective terms “independence” and “autonomy”. Or in Tibetan: rangwang (freedom), rangzen (indepdendence), and rangkyong (autonomy). In the Tibetan exile political discourse, however, there seems to be a blurring of lines between these three ideas. For example, supporters of both independence and autonomy have muddled the message of the self-immolators. Wang Lixiong performed an analysis of self-immolators’ last words in December 2012 (so now it is obviously outdated) that found that 38% prayed for His Holiness the Dalai Lama, 35% expressed courage or responsibility, 19% called for Tibet’s independence, etc. Many of these categories also included a call for freedom. Importantly, not a single self-immolator called for autonomy. At least one prominent pro-independence writer has suggested that a self-immolator calling for the return of His Holiness necessarily implies a demand for Tibetan independence. We believe this goes too far. It could in theory be true, or it could simply mean the return of their religious leader: the point is that we cannot know for certain unless they say it. - First, some self-immolators have expressly called for independence, while none have called for autonomy. - Second, the Kashag and Sikyong often use the word “freedom” to promote their specific Middle Way policy of autonomy, implying that the goals are either “freedom” (really meaning “autonomy”) or “independence”. Furthermore, it is a conspicuous omission when the Kashag argues that self-immolation is caused by “political repression, economic marginalization, cultural assimilation and environmental destruction”. This list prominently ignores that many self-immolators demanded independence. So it seems this list should also include not just “repression” (which is a human rights issue) but also “a demand for Tibet’s independence”. That would make it far more complete. In another recent example, at a book-launch about Takna Jigme Sangpo, the Sikyong discussed the former political prisoner’s “activism”, “various political activities”, and “slogans of Tibetan freedom” while in prison. This was a painful omission: the core motivation of Sangpo’s heroism was, quite simply, Tibetan independence. This should not be edited out even if one supports autonomy. In fact, Sangpo was originally sentenced for “seeking ‘Tibetan independence’ among other reactionary propaganda”, according to Chinese documents. However the Sikyong merely referred to Sangpo’s “opposition against harsh policies”, implying that Sangpo merely disagreed with certain Chinese policies. It is truly regrettable that, in this case, Chinese sentencing documents are more accurate than the Sikyong’s remarks. We believe that it would help set a better tone in the independence/autonomy debate if everyone used the correct terms, and did not attempt to edit out views of other Tibetans. It is especially important not to edit out or improperly co-opt the words and sacrifices of the self-immolators and political prisoners. The fact is, freedom is subjective and could mean several things. Independence and autonomy are basically objective and have clear meanings (even if autonomy has almost infinite variations). Probably every single Tibetan wants “freedom”. It is something we can all rally behind. But what is freedom? Some might define it as independence, some might mean a type of autonomy, and some have even talked about settling for basic civil rights as Chinese citizens. If we all use the correct terms, and acknowledge and respect that there are differing views of “freedom”, this will go a long way toward promoting a more productive discussion.